As expected, the first proper post-Christmas week is quite quiet on the gig front but there is still a great double-header taking place Saturday in The Pavilion. 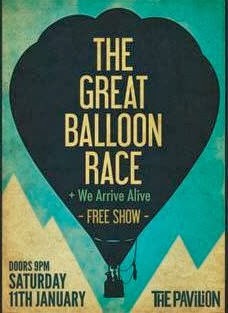 Psych-folk jazzers The Great Balloon Race and instrumental shoegaze stalwarts We Arrive Alive - both past participants in The G-Man Presents... showcases - team up to play a free Saturday evening show on Carey's Lane. Even if Patrick's Street goes all biblical and floods Noah-style between now and Saturday, this one is worth building an ark for.